EcoGreen started off as a company producing and selling organic products many years ago. 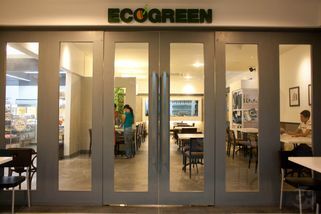 Soon, they expanded their services and now, there’s an EcoGreen restaurant conveniently situated in TTDI. 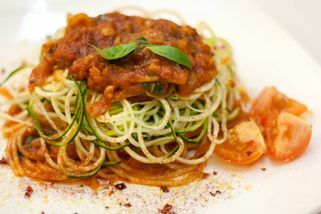 Everything on the menu is made from organic ingredients-a healthy choice for everyone in this day and age. 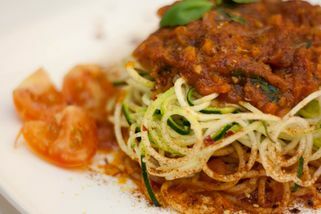 Some of their specialties are lui cha, nasi ulam, and tomato basil spaghetti. All their dishes are created in-house and there are many new dishes and specials all the time. The restaurant has a very clean, minimalistic, yet classy ambience-definitely very relaxing and a great place to unwind and have some healthy food after a long day or week. The EcoGreen grocery store is located right inside the restaurant, in the lot right next door. There are lots of organic vegetables, fruits, as well as specialty products such as honey, flaxseed oil, and much more. EcoGreen also does catering for functions; either in their restaurant itself or at your location. "Healthy without compromising on taste." Visited this place with fellow reviewer randomfoodie and loved everything there. I had the fish laksa based on staff's recommendation and found it to be tasty with complex flavours, yet it's non greasy and non cloying. 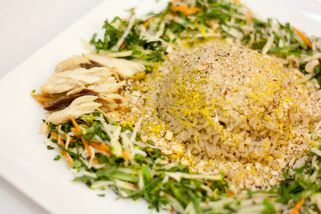 The lemongrass salad is a must try and love at first bite. We enjoyed the chia drink not only for the benefits but it was also refreshing for the hot weather. Highly recommended! I stumbled upon this place by accident many years ago at the other outlet situated in Bangunan Siti Hasmah below my pilates studio and went there to eat by myself frequently. In 2007 I even threw a lunch for 14 pax after we liberated some (1800+) animals at the nearby park in memory of my beloved cat Dalawa. Everybody liked what they ate back then. Somehow I stopped visiting that location since, but I rediscovered my favourite sour spicy steam fish in 2012 and I am pleased to learn that the taste that my memory craves is still the same after so many years. That made me very happy. What I love most about going there is that I get to learn more about organic food just browsing around in the grocery shop and it also inspires me to observe how the dishes are made so fine, casual yet delicious. I have a pet peeve with oily food and this place is great because I can hardly trace much oil in most of the dishes that I have tried. Eating healthy and going green is a growing interest of mine, so I love this restaurant even more now. The chili is spicy as spicy chili should be, although the heat has a unique (probably organic) twist to it. Despite the perception of such a shop to be mild with taste, the food is not only healthy, but incredibly flavourful with a pleasant home-cooked feel. They also serve Hakka lui char which is very good according to my mother (the health conscious acupuncture doctor). 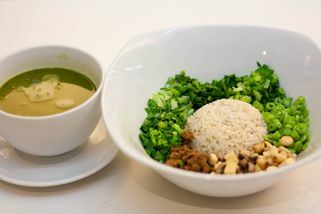 Personally I dislike how green the dish is but judging from the looks of it, anyone looking for this rarely found traditional dish is bound to be satisfied - especially the conscious tree-hugging vegetarians. Don't miss the chia drink, it is something different. It comes in a small jar with shot-sized glasses so you can share it around and still order your own individual drinks. 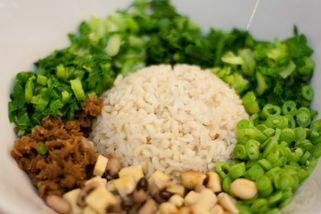 Try the lemongrass salad wrap to share too, I don't think anyone will regret that. I dislike peanuts but I still liked it despite that peanuts are part of the tangy dish. Nothing beats eating yummy food and knowing that it is designed with healthy living in mind. Both their outlets are convenient for doorstep parking or driver drop-off, although you can get slightly wet if there is a rainstorm. Although they are situated at the other end of the world from me, whenever I venture to the 60000 postcode, I plot to have a meal there. 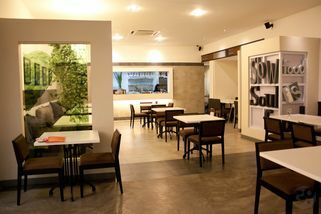 The ambience is quiet with minimal soothing music in the background, suitable for meaningful chats/discussions. They have free wifi and it is a comfortable spot to surf the web, work on a proposal, read a book or simply to spend undisturbed moments. You will notice the owners' presence and they are knowledgeable as well as passionate to save the planet, that deeply resonates with my amateurish aspirations to get green. I hope they will remain open for a very long time and it would be nice if I can go there more often. It is one of those surprising places that looks almost too sterile to be tasty, but believe it. Go eat there at least once and make your own judgements. The food here is fantastic. From its name I thought that it would be bland, but it was a big surprise. The desserts are also excellent, especially the walnut cake. Again, not overly sweet and greasy like you get somewhere else. It's just right. Service is very friendly. The restaurant wasn't busy when I went, and the food came out fast. Organic meals aren't cheap, so expect an above-average bill here. Tried their tomato basil spaghetti is awesome!! Love it so much. For a vegetarian dish, it has LOADS of taste and is absolutely delicious. Will go back there just to eat it again!